These renovations and upgrades will ensure that every guest staying with us during the busy cruise season, especially our guests with disabilities, will feel welcome and taken care of. Rodeway Inn & Suites - Fort Lauderdale Airport & Cruise Port, a budget-friendly, full-service hotel near Fort Lauderdale Port Everglades Cruise Port and near the Fort Lauderdale/Hollywood International Airport (FLL), recently completed hotel upgrades in preparation for the busy South Florida cruise season. The upgrades include new and improved ADA rooms, renovations and updates to guest rooms, as well installation of High-Definition television in every room. "We host more cruise passengers than any hotel in the Fort Lauderdale area," stated Izzy Fintz, Hospitality Manager at Rodeway Inn & Suites Fort Lauderdale Airport & Cruise Port. "These renovations and upgrades will ensure that every guest staying with us during the busy cruise season, especially our guests with disabilities, will feel welcome and taken care of." Rodeway Inn & Suites Fort Lauderdale Airport & Cruise Port is a budget-friendly, full-service Fort Lauderdale hotel in close proximity to popular South Florida tourist destinations such as Downtown Fort Lauderdale, Fort Lauderdale Beach, Broward Convention Center, Port Everglades Cruise port and the Fort Lauderdale/Hollywood International Airport (FLL). 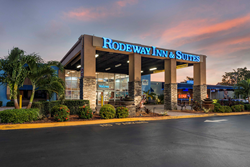 Rodeway Inn is a top hotel for cruise vacationers, providing cruise port and airport shuttle services, long-term cruise parking as well as Day Rooms for disembarking guests.